It's a pretty good bet that at some point you've tried a fruit beer, or even brewed one yourself. And odds are also good that the fruit used was something more or less traditional - raspberry, cherry, peach, and so on. While there's nothing wrong with these fruits as beer ingredients, there's a whole other category of fruits that can be used to spice up your brewing: the chiles. Chiles (or chilis or chillis, depending on where you live) are the fruits of plants from the Capsicum genus, flowering bushes native to the Americas. Chiles are also frequently called "peppers" or "chile peppers", due to confusion with peppercorns by early European consumers. Chiles are now grown worldwide, and even the commonly available varieties number in the hundreds. Their flavor and aroma compounds span the spectrum of human perception, mimicking nearly every other fruit and vegetable imaginable. What makes chiles special, though, is their uniquely piquant flavor. The piquancy - the "spiciness" or "hotness" - of chiles is due to capsaicin and a few related compounds, alkaloids which are produced in the septa ("ribs") of the peppers. Removing this white, fibrous material from the inside of the chiles - along with the seeds - and using only the skin can render an otherwise too-piquant pepper suitable for your beer while preserving the desirable flavor and aroma characteristics. When in doubt, I find it's always best to deseed chiles. Additional piquancy can be quite easily added to a beer, but it is nearly impossible to remove. 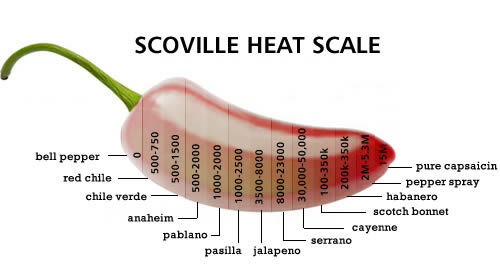 Piquancy in chiles is expressed using Scoville Heat Units (SHU). The original Scoville method measured the dilution of a chile extract required for its piquancy to be undetectable by the human palate. Obviously, this introduces a great deal of uncertainty, and nowadays capsaicin content is measured directly, but the SHU convention remains. 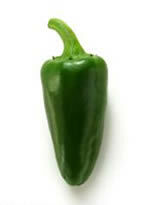 The piquancy of chiles ranges from 0 SHU for the sweet bell peppers to nearly 2,000,000 SHU for the hottest varieties. For comparison's sake, that's about the same as law-enforcement-grade pepper spray! Green Chiles: Also known as Hatch or New Mexico chiles, green chiles are relatively piquant (500-2,500 SHU) cultivars of the milder Anaheim chile. They have the fresh pepper character of a bell pepper, but without so pronounced a "green vegetable" flavor. 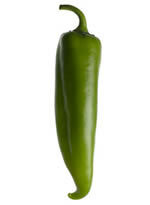 If fresh green chiles aren't available, another mild green pepper such as a poblano or mild jalapeño can be substituted. Jalapeños: A moderately piquant (2,500-10,000 SHU) pepper, jalapeños are available nearly everywhere, and are the definitive flavoring agent that most of us associate with chiles. They are an excellent choice for adding piquancy without overwhelming the other flavors in a beer. Chipotles: A smoked variant of the jalapeño, chipotles add a savory, earthy flavor and smoky flavor and aroma. They are especially useful when combined with roasted malts or with other spices, as they would be in a mole sauce. Rehydrating the dried peppers in water can make them easier to work with. Habaneros: These highly piquant (100,000-500,000 SHU) chiles have a wonderful citrus flavor and aroma that compliments American-type hops well. Unless extreme piquancy is desirable, they should be deseeded for brewing. Whenever possible, whole chiles, either fresh or dried, should be used. If your local selection is lacking, there are many online sources available. Dried chile flakes and powders are frequently stocked by supermarkets, but as with any other fruit or vegetable, improper handling may have degraded their flavor and aroma characteristics. The small particles can also be difficult to remove from the finished beer, leading to appearance issues or, worse, inconsistent flavor from one sip to the next. Diced, canned chiles are also common; they can be used to good effect but one must ensure that the canning liquid does not contain additional, undesired ingredients. Like other fruits, chiles can be used at any point in the brewing process, depending on the desired result. I liken their effects to those of hops: the earlier in the process the chiles are added, the more bitterness they will impart, and the less aroma will be retained. For this reason, I generally use chiles like a dry hop, adding them to the fermenter for 5-7 days once fermentation is complete or nearly complete. Their capsaicin content also gives hotter chile varieties anti-microbial properties, just like hops. 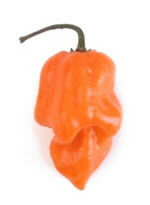 Remember, though, that the capsaicin is concentrated in the interior of the fruit. 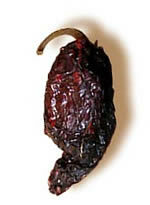 The skins of the chiles should be assumed to be covered in microorganisms, and sanitized before brewing. • Rinse the chiles to remove dust, pesticides, and other surface contaminants. • If desired, slice the chiles lengthwise and scrape with a spoon to deseed the chiles. • Coarsely chop the chiles. I like to work with pieces about 1/4" (6 mm) square. • Remove the resulting pieces to a clean jar and add just enough of a neutral spirit like vodka to cover the chiles. • Wait a week or so for the alcohol to extract the chiles' flavor and aroma compounds. 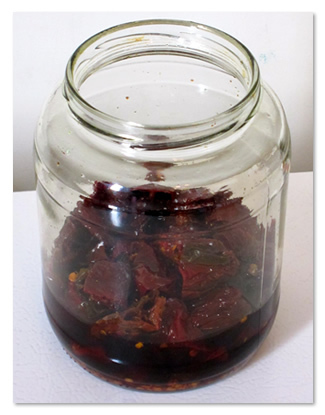 • Strain the chile-infused alcohol into another container and discard the "spent" chiles. • Working with a small sample of beer, add the chile extract dropwise until the desired result is obtained, then scale up to the full batch volume. The chile extract can be added to the fermenter, keg, or bottling bucket, or even be used to "dose" an individual beer to the drinker's desired level. Any excess can be stored indefinitely for use in a future beer or in the kitchen. These three recipes are tried-and-true favorites of mine. Hopefully they serve you well in your brewing, or provide the inspiration for something you like even better. When brewing with chiles, the only limit is how creative you want to be. Chipotle Stout: The smoky flavor and subtle earthy bitterness of the chipotles stands in for additional dark roasted malt, eliminating the "ashy" character and leaving a smooth, drinkable beer. The esters from an English yeast strain help to round out this twist on a venerable style. Mix grain with strike water and mash the appropriate time suggested in the mash schedule above and then mash out. Fly sparge with 2.64 gal water at 168.0 F . Boil 6.22 gal for 60 minutes adding the bittering hops at times suggested in the ingredient list. Add the whirlfloc tablet when 15 minutes remain in the boil. After the boil is complete, chill the wort rapidly to 64 F and transfer to a sanitized fermentation vessel. Ferment at 64 F for 7 days. Transfer to secondary and add your chiles. Once the desired level of heat has been added, crash the beer for 3 days at 39 F and then bottle or keg with priming sugar (skip the sugar addition if force carbonating in your keg). Substitute 4 lbs. 7.3 oz. liquid Maris Otter Extract for 6 lbs. 12.6 oz. of the Maris Otter Malt. Mini-mash 1 lbs. 11.4 oz. Maris Otter malt with the remaining grains at 152 F for 60 minutes. After the mash, heat to 168 F for over 7 min. Strain, add remaining water and malt extract, bring to a boil, and proceed with the recipe as stated. Green Chile Oktoberfest: The chile harvest in the Southwest coincides nicely with the traditional festbier brewing season, and combining the two seemed like a natural result. The astringency and mild piquancy of the chiles balance the rich malt character of what would otherwise be a very sweet "Americanized" Oktoberfest. This beer is an excellent pairing with just about any savory food. Mix grain with strike water and mash the appropriate time suggested in the mash schedule above and then mash out. Fly sparge with 1.63 gal water at 168 F. Boil 6.22 gal for 60 minutes adding the bittering hops at times suggested in the ingredient list. Add the whirlfloc tablet when 15 minutes remain in the boil. After the boil is complete, chill the wort rapidly to 50 F and transfer to a sanitized fermentation vessel. Pitch and begin fermentation at 50 F. Once gravity drops below 1.025 SG, the temperature may be increased to 61 F. Rest warm for three days once terminal gravity is reached, then crash to 39 F for three days before transferring. Bottle or keg with priming sugar (skip the sugar addition if force carbonating in your keg). Substitute 3 lbs 16.0 oz. liquid Pilsner Extract for 5 lbs. 12.1 oz. of the Pilsner Malt. Mini-mash 1 lbs. 3.9 oz. Pilsner malt with the remaining grains at 156 F for 60 minutes. After the mash, heat to 168 F for over 7 min. Strain, add remaining water and malt extract, bring to a boil, and proceed with the recipe as stated. Habanero IPA: The inspiration for this recipe was a delicious mango-habanero chicken wing sauce. The naturally citrusy character of the habanero peppers pairs well with the fresh fruit flavors of the large late hop additions, and a relatively sweet malt character (for the style) with high alcohol content helps to balance the intense piquancy. If Citra hops aren't available, try substituting another "tropical fruity" variety like Belma, Galaxy, or Motueka, or experiment with a more traditional American hop or hop blend. Mix grain with strike water and mash the appropriate time suggested in the mash schedule above and then mash out. Fly sparge with 0.34 gal water at 168 F. Boil 6.22 gal for 60 minutes adding the bittering hops at times suggested in the ingredient list. Add the whirlfloc tablet when 15 minutes remain in the boil. After the boil is complete, chill the wort rapidly to 64.0 F and transfer to a sanitized fermentation vessel. Ferment at 64 F for 7 days. Transfer to secondary and add your chiles. Once the desired level of heat has been added, crash the beer for 3 days at 39 F and then bottle or keg with priming sugar (skip the sugar addition if force carbonating in your keg). Substitute 7 lbs. 2.3 oz. Pale liquid extract for 10 lbs. 4.2 oz. of the Standard 2-Row malt. Mini-mash 2 lbs. 11.8 oz. 2-Row malt with the remaining grains at 152 F for 75 minutes. After the mash, heat to 168 F for over 7 min. Strain, add remaining water and malt extract, bring to a boil, and proceed with the recipe as stated. A nuclear engineer by trade, Sean Terrill has been home brewing for over nine years, and professionally for three. He is the owner of Two Mile Brewing Company, a brewpub-in-planning in Leadville, CO. 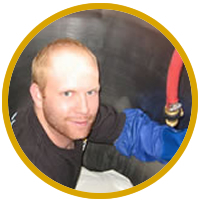 He recently contributed an article on Low-Tech Yeast Management for Home Brewers. Sean holds a Bachelor of Science degree from Purdue University in Nuclear Engineering.